Identifying characteristics: White flowers with four petals. 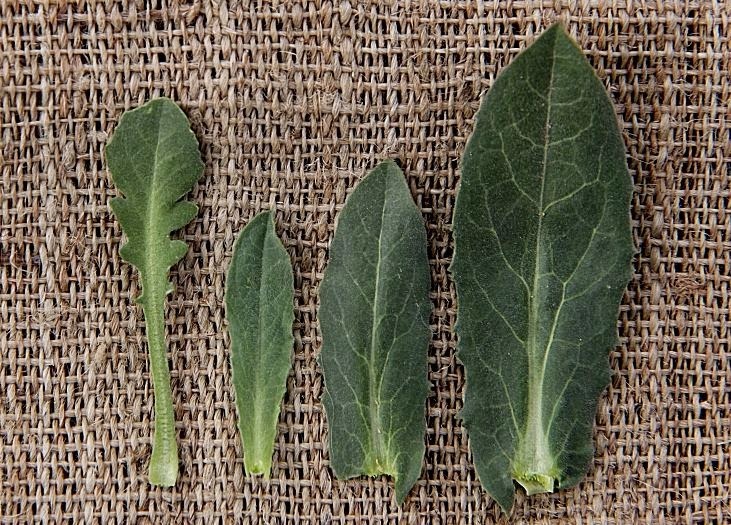 Upon close inspection, the plant is covered in fine hairs (see picture of leaf morphology below). From a distance, the leaves have a slightly blue-green cast (unlike pennycress, which has a slightly yellow tone to its leaves). 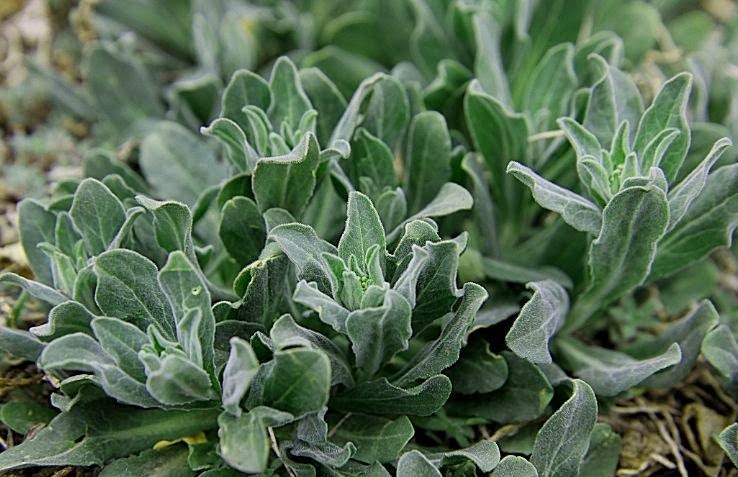 Will form vast carpets of plants that are especially noticeable in full bloom. 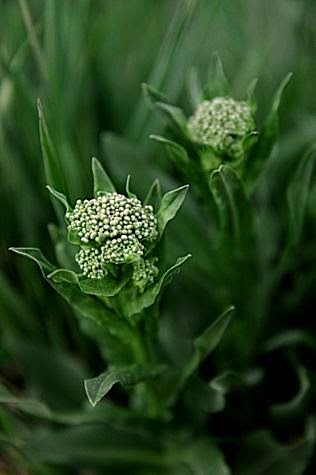 Edible parts: Tender new growth, leaves, closed inflorescence, flowers, seeds. 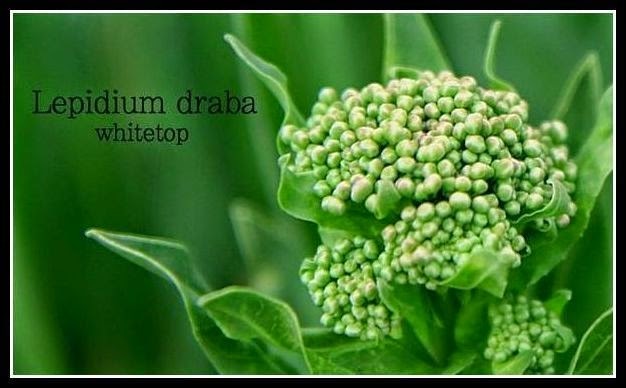 The top few inches of growth, along with the closed flowering heads (which look like tiny florets of broccoli or cauliflower) are my favorite part of this plant to eat. Taste: This plant has a more pungent, spicy taste than musk mustard, and gets stronger as the plant matures. Especially when eaten raw, the taste will linger a bit, and you'll know you've eaten a mustard plant. However, when eaten young, I find the plant to have just the right amount of bite, especially when cooked. Taste a few plants from the patch where you are harvesting to make certain they aren't too spicy to enjoy. 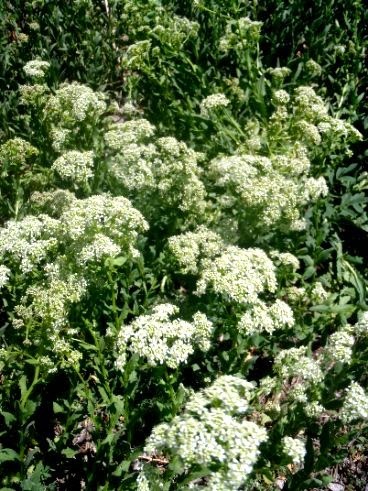 Cautions: Some authors caution that young Lepidium draba may contain hydrogen cyanide. Cattail Bob Seebeck has indicated that this could only be in small amounts, and is easily rid by cooking. As with most wild foods, it's a good idea not to eat insanely large amounts of the plant in one sitting, though there seems to be little need to fear it. Status: This plant is on Colorado's B List of noxious weeds. Eat it freely, as it is an invasive species. Holy crap that stuff is all over! Good to know that I can eat it. With a picture like that first one, you could sell anyone on eating weeds. Makes sense, if it's related to broccoli. Exactly! I made a really fantastic rice and whitetop casserole with a cheese sauce the other night. Cool, these "studies" are great! Keep 'em coming! Thank you, my dear/deer. You know how much your opinion means to me. 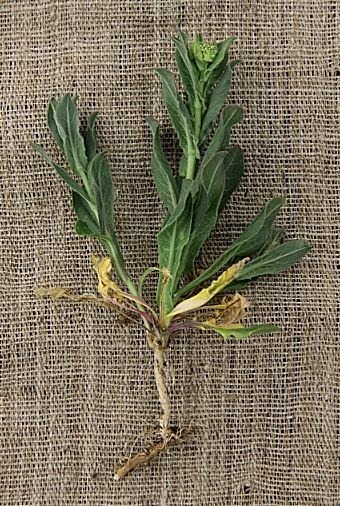 I've posted how the bitterness is traditionally leached out of Lepidium latifolium in the Himalayas. It is another very invasive non-native weed in North America.